If you're ever craving after a meal of delicious shabu shabu, you may find yourself in quite the dilemma while living on Okinawa. Shabu shabu restaurants are positively few and far between on Okinawa, but one in particular is quite easy to find and well worth the drive if you don't mind making a trip down to Naha. Jyu Jyu is located in the same area as Pallette Kumoji Ryubo and serves some of the most delicious shabu shabu I have had in my whole life at a very reasonable fee. 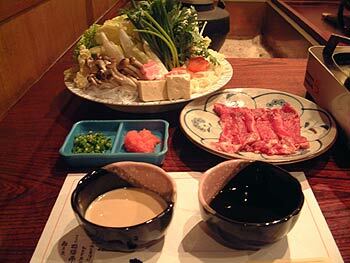 If you're unfamiliar with shabu shabu, or as some say "steamboat", cooking, during a shabu shabu meal, visitors of Jyu Jyu are each brought a plate of raw beef, two bowls for sauce, and one large plate of various vegetables for your table to share. A large pot of water is also brought out and placed on top of a gas burner right in front of you. After the water begins to boil, cook your meat and vegetables by dipping them in the boiling water. Beef cooks quite fast and only requires a few seconds in the hot water to be thoroughly cooked, but vegetables take a bit longer. You can leave them in the pot for a few minutes until they are soft before eating. There really is nothing quite like shabu shabu. If you've never tried it, you should. 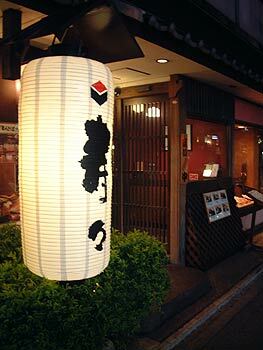 It's positively one of the greatest dining experiences you can have on Okinawa or abroad. Jyu Jyu has an extensive menu with many of the same dishes you'll find at most izakayas on Okinawa, but all of the menus are written in Japanese, so ordering may be an ordeal for the average foreigner visiting Jyu Jyu. Because most of the dishes on the menu are the same as are served at other izakayas and restaurants, I will focus on explaining how to order all you can eat shabu shabu for yourself instead of translating Jyu Jyu's menu. If you're visiting Jyu Jyu, you're probably coming for the shabu shabu anyway. To order all you can eat, tell the waitress, "Shabu shabu tabehodai," which means you'd like to order the all you can eat shabu shabu meal. This meal costs ¥2,000 and comes with more meat and vegetables than most people can handle. Once you finish off your first (or second, or third, etc) plate of beef, if you want more, call the waitress and say, "Niku okawari kudasai," which means you'd like another plate of beef. I always try to starve myself for most of the day before visiting Jyu Jyu, so during my visit I was able to eat about three plates of beef by myself, but no matter what, I have never been able to finish the full plate of vegetables. It's just too much! Your meal also comes with a bowl of steaming rice which you can eat with the meal or after. If you wait till after you finish the shabu shabu portion, you can mix the water in the pot with your rice for a delicious rice soup. The meat and vegetables leave great flavor in the water, and the rice mixed with this water is certainly delicious. Jyu Jyu also has a variety of beer, awamori (Okinawan sake), nihonshu (Mainland Japan sake), and soft drinks for you to choose from. Draft Beer, called "Nama," sells for ¥500, and a bottled beer costs between ¥550 and ¥600. Awamori and nihonshu sells for between ¥500 to ¥700 per flask (about 3 servings) or from ¥1,800 to as much as ¥10,000 per bottle. All soft drinks sell for ¥300. As I mentioned before Jyu Jyu also has many izakaya style dishes, but if you're the shy type you might want to bring a local friend to help you with the menu. The restaurant itself has a very large dining area and is quite popular and busy during the evening. The food is absolutely delicious. After my first visit, Jyu Jyu quickly became one of my top ten favorite restaurants on island. Jyu Jyu opens daily at 5 p.m. To get there, if you are driving south on route 58 from Ginowan City, continue south towards Naha. Once in Naha, continue south past the Kumoji intersection. Keep straight and you'll eventually get close to Pallette Kumoji Ryubo. Turn left towards Ryubo and head straight. Ryubo will be on your right hand side. You'll see a one way road on your left a little ways after turning off of route 58. Turn here. Jyu Jyu will be up ahead on your right. Park at paid parking and walk the rest of the way.